Flat Two Tone Wedding Ring For Men : LOVE2HAVE in the UK! A flat profile wedding ring for men that features a natural grey zirconium centre with shiny black shoulders. 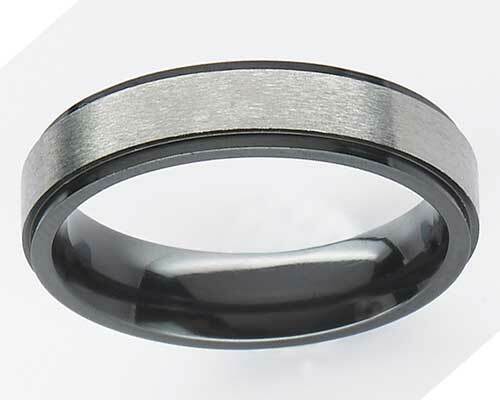 The grey centre raised in a stepped style profile is another example of a relieved black ring that comes with a satin finish, therefore making it a great wedding ring for men with the two-tone styling and hard wearing properties. The ring is pictured here is 7mm in width with a matte finish, but polished is available too together with other widths. Please contact us for further details.